A colorful story (which is confirmed by the restaurant's web site) says that Bai Tong was opened to serve pilots on the Thai airline landing at SeaTac International, providing the same type of Thai cuisine they would find at home. Many of the airline personnel must have enjoyed the authentic food at Bai Tong just about as much as the refreshingly cool weather normally found in the Puget Sound area. Many people in the Seattle area enjoy Bai Tong as well, either making special trips to the restaurant or eating there when they have occasion to go to the nearby airport. 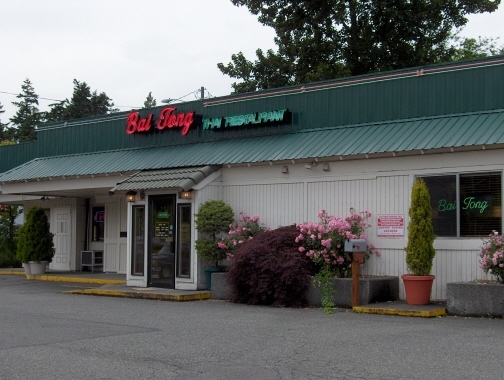 Bai Tong's old building was not one of the most elegant restaurants in the Seattle area, as evidenced by the covered parking lot that once served as a place where patrons sat in their cars to order root beer and fast food. Bai Tong has since moved to a new location in Tukwila which I have not yet had a chance to visit or to take a photograph (the photo of the old building shows how the management did the best decorating job they could with a building that had seen better days). The comfortable, somewhat down home dining rooms at the old building, however, seemed to be a perfect setting for the down home Thai food served here. The menu has just about everything that would be expected in a Thai restaurant, and if you do not see what you want, it may be available if you ask for it. Ginger Tofu is not something that was listed on the menu, but they were able to prepare a pad king dish that was one of the best versions I have tried anywhere. It was a little sweet, but the flavor of all the ingredients came through for a very enjoyable dish. Phad Prik Khing was not listed on the menu, but is number 31 on the new menu that was printed to coincide with the opening of the new location in Tukwila. This red curry dish, made without coconut milk, always seems to be one of my favorite Thai delicacies. The one at Bai Tong, though, was so expertly prepared it may be the best I have had anywhere. The green beans tasted as if they came from someone's backyard garden, and convinced even a meat-eater who accompanied me that vegetables can make a worthy entrée. The sauce, though, although similar to the ones at other good restaurants, seemed better here. The staff says that Phad Thai and the curry dishes are the specialties of the restaurants, and I certainly concur with the versions of curry I have had the pleasure to sample. The menu has been expanded for the new location, and I think this is all the more reason to make a visit to one of the best and most authentic Thai restaurants in the Seattle region.